The Isle of Man's attorney general "lied under oath" ten weeks before he was appointed as the main legal advisor to the government, a court has heard. Stephen Mark Harding faces charges of perjury and acts against public justice between April and September 2010. Prosecution QC Peter Wright alleged Mr Harding committed perjury during an Advocates Disciplinary Tribunal in 2010 and "submitted false documents". Mr Harding, 52, from Glen Vine, denies all charges against him. The charges relate to a period of time when Mr Harding was a Manx government advocate, a position he had held since 1992. The jury of seven was told that in 2009, property development company Street Heritage Ltd (SHL), found itself in financial trouble, with a tax bill of more than £180,000. After failing to come up with a suitable repayment plan, a court date was set to begin the process of liquidation - something the company directors were keen to avoid. In the run up to the hearing, the court was told the directors had secured a loan and progressed plans to sell a property in an attempt to meet their bill. 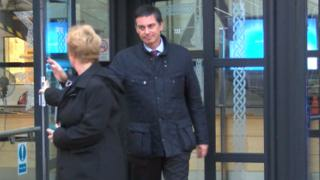 They planned to ask the courts for more time, information the prosecution claims was relayed to Mr Harding. The firm's advocate did not appear in court for the hearing because he got the time wrong and Mr Harding remained silent about the company's plans to meet its bill, the court heard. That silence amounted to a "failure in Mr Harding's public duty" said the prosecution, something which resulted in a formal reprimand during a tribunal later that year. It also led to the liquidation of SHL, a move which the prosecution claims, "had catastrophic consequences" for all involved. The tribunal found Mr Harding's professional misconduct to be an "isolated incident" and about ten weeks later he was appointed attorney general. But the prosecution alleges that during the tribunal, Mr Harding "lied under oath" and submitted false documents to "cover up the lies". "This man misconducted himself during court proceedings, he did this consciously, and intentionally- it wasn't a naive mistake, anyone with an ounce of legal understanding would know he should not have done what he did," said Mr Wright. "Thereafter, knowing there would be consequences, he set about covering his tracks and then lied on oath before a disciplinary tribunal." Stephen Harding was suspended in 2012- John Quinn is currently the island's acting attorney general. The retrial at Douglas Court House, which is expected to last about two weeks, continues.